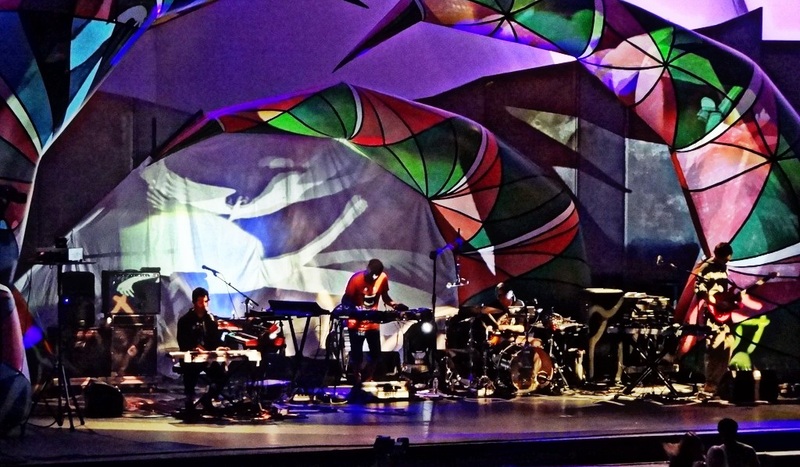 Animal Collective and Flying Lotus would strike most as odd bedfellows with just about any act on just about any bill. In their own right, each act escapes apt categorization and when it was announced months ago that KCRW would be presenting the two appearing together on a Sunday night at the legendary Hollywood Bowl, this strange pairing oddly made a great deal of sense. 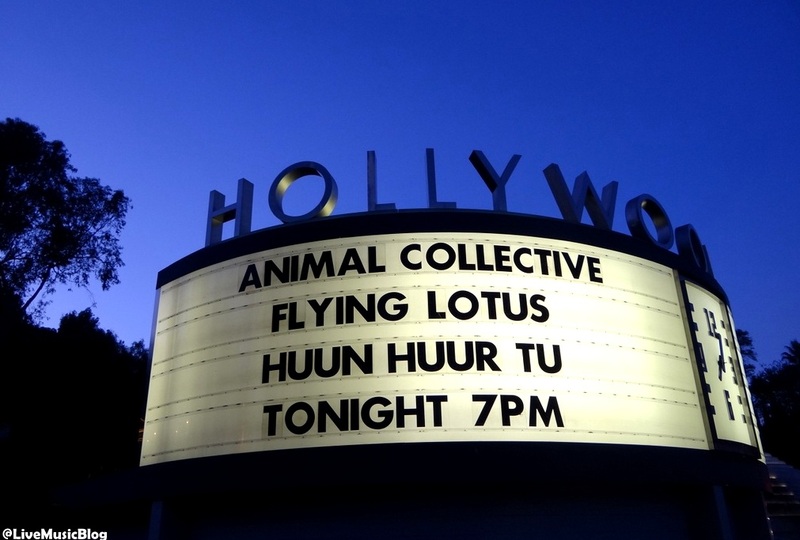 Throw the opening act throat-singing quartet Huun Huur Tu in the mix and Sunday night’s bill was undoubtedly one of the more intriguing lineups of the year in the L.A. area. Experimental producer Flying Lotus’ multi-layered set was downright mesmerizing, an impeccably psychedelic splicing of too many different genres and subgenres to recount here with a visually stunning accent that had most in the crowd in tunnel vision mode throughout the set. The set went by in a flash and it was one of those things that left me shaking my head in happily bewildered disbelief and wishing there was another hour at least. In the span of about 40 minutes, I went from a casual appreciator of his talent to a super fan. 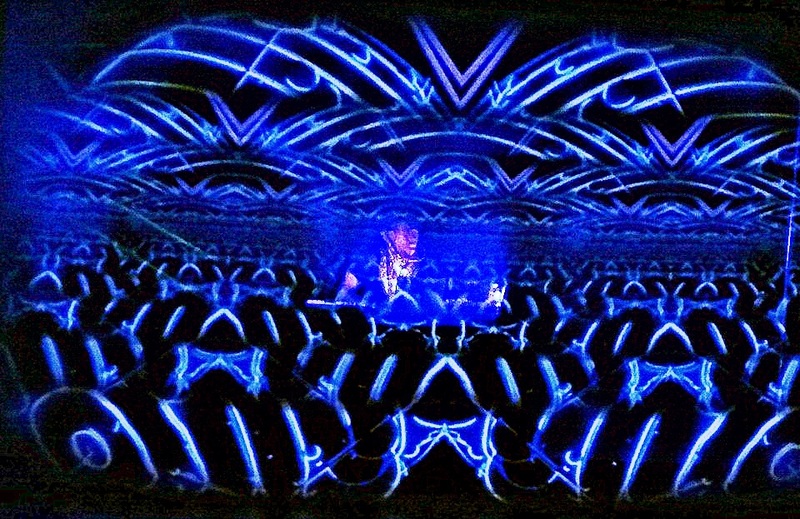 FlyLo’s sonic arsenal runs super deep, and it was plain-as-day to see that only the tip of the iceberg appeared during this set – which, for a casual fan of electronic music, was light years beyond any previous DJ set I’ve witnessed. First, Animal Collective’s colorful Alice and Wonderland-esque stage build (a living representation of the band’s album cover for their new LP Centipede Hz) was worth the price of admission by itself. Certain shows at the Bowl have stood out in this aspect and AnCo’s LD deserved a standing ovation of his own after this show was over, working the rings of the Bowl’s shell at a frenetic, freakout-inducing pace during some of the high-strung portions of the show. The allure of Animal Collective to me is the inability to pigeonhole them or predict what their next move will be, whether in the studio or on the stage. Over the course of their career, they have created their own unique universe of music, innovating where others have homogenized, refusing to play within the normative bounds of modern music in a landscape where a monster ‘drop’ or peak-a-song instant gratification is in ample supply. This show built upon itself throughout, with a heavy emphasis on flow as the buzzword of this and conceivably every night on this tour. After a rather odd choice of opener (“Also Frightened”) weaved towards “Applesauce”, there was the kaliedoscopic and robust “Wide Eyed”, aceentuated by considerably more substantial drums and glowing reverb on Deakin’s vocals. The slowly, constantly ascending energy both on stage and in the crowd began to really build with Centipede single “Today’s Supernatural”, and a bizarrely re-tooled “Lion In A Coma”. The new songs mostly sounded great, fitting in well amongst older tunes like the “Brother Sport” -> “Peacebone” (a huge standout) -> “My Girls” segment that closed down the set before the encore. Just as the show started, in unassuming fashion, the band flowed through “Amanita”, creating one final day-glo sound storm that ended with the song still breathing and evolving, leaving the crowd hanging on the final notes. The near-impossible sonic ambidexterity this band operates with can sometimes lead down wild and densely layered paths of aimless meandering. However, when the crowd is engaged, the journey through these ear-shocking squalls can and often does reap a great reward for the attentive listener once the other side is reached. In the moment, it was hard to make sense of it all at times, but looking back already, its easy to see that I’ll remember this entire show on the whole as far exceeding my past live Animal Collective experiences. To say the music and visuals were jarring and disorienting at times would be a major understatement but when it was all said-and-done, we, and most in attendance left happy and wide-eyed and sensory overloaded, awash in waves of noise, light and color that beamed from the hallowed stage. EDITOR’S NOTE: Also, randomly spotted and spoke very briefly with Skrillex outside before the show. Sonny was excited to see FlyLo.